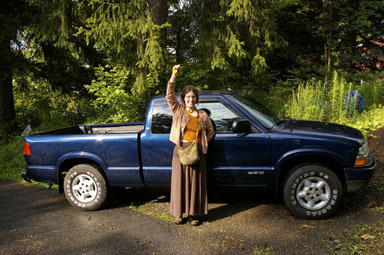 There have been a lot of times in the recent permaculture work when I've wished for a pickup truck in place of my Saturn sedan. That free manure pile on Game Farm Road calls, and getting machinery repaired or furniture moved has always been a special challenge. Angelika's going to be starting an orchard in August, however - so now we not only had a reason for a (used) truck, we had a clear need. It seemed like dealers only carried larger trucks, and the small trucks were stripped down, often without 4-wheel drive. We were hiking Thursday on the Jim Schug trail when I suggested we try Stafford Chevrolet in Dryden on the way home. We did, though it wasn't too promising at first. The trucks that looked promising were too new and expensive, but with Tony Canella's help, we found one on the back lot that fit our needs well. According to CarFax, it's only had one owner, was originally sold by Stafford, and probably spent most of its time around here. We brought the truck home yesterday, where Angelika celebrated. It's not my dream vehicle (since that doesn't yet exist! ), and gets around 20mpg, but it'll do very well to get Angelika going on the orchard. We kept my old Saturn (which gets around 30mpg) for driving around town as well. It may not be trees or fertilizer, but it's a critical tool for the orchard to come, and there'll be a lot more here on how that goes!